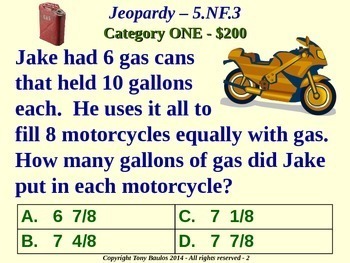 Fifth Grade Common Core Math Jeopardy Game - 5 NF.3 Division of Fractions Word Problems 5.NF.3 Practice provides two ways for students to practice and show mastery of their ability to solve word problems involving division of whole numbers leading to answers in the form of fractions or mixed numbers. Jeopardy board includes 25 distinct problems and utilizes hyperlinks to award/deduct money from your student teams! (79 slides in all!) Board is automatically updated to show which questions have already been utilized. Also includes an Answer Key if you wish to use questions as Quiz/Test. The PowerPoint file can be used on computers, or Promethean and Smart boards. Take a look at the preview file and buy today for your students benefit! Common Core Standard: 5.NF.3 Apply and extend previous understandings of multiplication and division to multiply and divide fractions. 3. Interpret a fraction as division of the numerator by the denominator (a/b = a ÷ b). Solve word problems involving division of whole numbers leading to answers in the form of fractions or mixed numbers, e.g., by using visual fraction models or equations to represent the problem. For example, interpret 3/4 as the result of dividing 3 by 4, noting that 3/4 multiplied by 4 equals 3, and that when 3 wholes are shared equally among 4 people each person has a share of size 3/4. If 9 people want to share a 50-pound sack of rice equally by weight, how many pounds of rice should each person get? Between what two whole numbers does your answer lie?